At the end of “No Greater Love”, part one of this epic film trilogy, Kaji (Tatsuya Nakadai) is handed a conscription notice. This film takes place a couple of years after the events of that film and sees Kaji in his role as a private in the Imperial Army. It is a tough life, but Kaji has decided to keep his head down and get through it. In fact, he proves himself an excellent shot and would be a model soldier if not for his belief in pacifism. A fellow recruit, Obara (Kunie Tanaka), in contrast is a poor soldier and repeatedly finds himself facing the wrath of his superiors and fellow conscripts. Kaji faces suspicion not only for his empathy with Obara, but his close relationship with fellow soldier Shinjo (Kei Sato), as the two of them are believed to have communist sympathies. Kaji battles with his decision to remain in the army rather than desert as it goes against many of his principles. “Road to Eternity” brings back only the characters of Kaji and his wife Michiko. 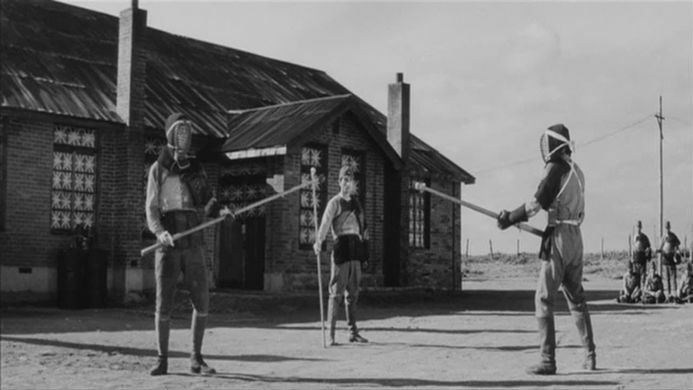 The rest of the film is a completely new story that takes us to another part of the war, that is basic training and the front lines of Japan’s Imperial progress. Again the film creates strong characters. As in the first we focus on Kaji and the antagonism his pacificism causes. He is abused verbally and physically, but never wavers from his convictions. As with the first film the story is told on a large canvas and with many characters. This makes the scenes in the barracks full of life and vibrancy. When they are digging the pits it also gives a sense of the monumental scale of events. The climactic battle sequence is incredible to watch with tanks and men scrambling across trenches as the ground explodes around them. As with much of the rest of the film it knows to keep its main focus narrow, while the broader strokes of the war are painted around. The character of Obara gives the audience an insight into the dehumanising process of army life. Similarly, at the end Kaji shares a moment with a young recruit that gives an emotional and relatable coda to the incomprehensible horror of the full battle. While the first film showed the cruelty of Japanese forces, this film gives a more pointed rebuke to the intentions of the government and Imperial Army of Japan. Before the film’s closing tank battle, characters are already discussing the inevitable failure of this venture. The Italian and German surrender means it is a matter of time before Japan falls. There are several men who are still firmly committed to the Ultimate Victory promised by their leaders. Kaji again is a solitary voice, telling them he would much rather be home with his wife than fighting these pointless battles. However, Kaji is also in turmoil over his own decision to remain in the army. He questions whether it is not more cowardly to remain than to flee when he knows that he is part of the problem. “Road to Eternity” continues the story of Kaji with a story that stands easily on its own. It creates a whole new scenario that plays off his experiences in the first film, while introducing new characters and ideas.